Windy Field Farms: Hello again! As a fellow blogger commented recently, sometimes other things get in the way, and before you know it, it's been ages since your last post - in my case, 6 weeks...yikes! In my defense, I have been attending 2 farmers' markets, and have added baked goods made with mushrooms to my sales table, so there's a bit more preparations involved. The customers I love to see are the ones who made their first purchase of mushrooms the previous week, and have promised to return with their comments. 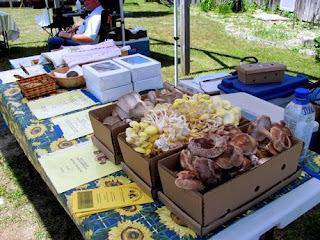 They arrive at my table with big grins, and tell me how surprised and thrilled they were with their mushrooms. One couple, who left with half a pound of mushrooms and my mushroom soup recipe, came back to tell me that they will never buy canned mushroom soup again...and yes, they were grinning! Aside from the mushrooms, I offer my now-famous mushroom dip, as a sampler and in two sizes of containers, freshly made that day and ready to be enjoyed. My customers come back to tell me all the different uses they found for it, aside from just as a yummy dip. My favourite so far is on top of a chicken burger from Heatherlea Farm Market. Of course, my fellow vendors are always more than happy to do a "quality control" check by sampling as often as they can get away with it! My snack-sized phyllo pastries are often gobbled up by shoppers as they buy their weekly groceries at the market. I offer vegetarian, made with my own spinach, swiss chard, leeks, onions, garlics, mushrooms and Feta cheese, and a beef version, with locally raised beef, onions, garlic, red pepper and of course, mushrooms. New recipes are brought almost every week, in keeping with the ever-increasing variety of veggies available as our summer season progresses. I will include a few at the end of this blog, and promise to add a few more before the end of the week. If you still have never been to a farmers' market....what are you waiting for?? A little bit of searching on the internet will probably help you find the closest one to you, no matter where you live. Join the hundreds of happy people who make the weekly trek with their baskets and cloth bags, to fill up on the wonderful bounty being offered. Stay for the season, and enjoy the changing menus you can offer your family, as we go from spring greens and asparagus, to summer beets, carrots, swiss chard and tomatoes, to fall squash, pumpkins, fall greens and of course, all the tasty fruits - plums, apples and pears. A wonderful book that I bought last year is "Simply in Season". I am now offering it at my table as well, because I want to share it with everyone. The recipes are organized by season, making the most of the produce and foods that are most plentiful during that season, with a wonderful "year round" section, featuring breads and year-round staples. Hope to see you soon at the markets! Cook mushrooms, onion and stock in large pot, covered, for 1/2 hour. Puree slightly (optional). In separate pot, melt butter, stir in flour and cook 2-3 minutes. Remove from heat and gradually whisk in milk. Add puree, salt and pepper. Allow to cool slightly, stir in 3/4 c. heavy cream (optional) and serve. Saute onions and garlic very lightly in canola or olive oil, until translucent. Stir in zucchini and cook for 3-4 minutes on medium heat. Add mushrooms, tomatoes, herbs and seasonings and continue cooking until tomatoes soften up, about 2-3 minutes. Sprinkle with cheese. Shiitakes and Swiss Chard - delicious over pasta or new potatoes! Saute garlic in oil for 1 minute, add sliced mushroom caps and cook for 5 minutes, stirring occasionally. Add wine, salt and pepper. Simmer for another few minutes. Remove any tough stems from Swiss chard, slice into strips and add to mushrooms. Cover and cook, stirring once or twice, just until greens have wilted, about 5 minutes. Taste, and adjust seasoning, if desired. Top with grated cheese and serve immediately. Welcome back. We love the local farmer's market. It is nice to get fresh produce from the guy/gal who grew it.